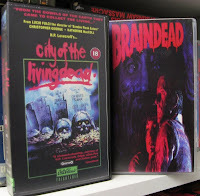 Before the likes of great independent genre studios making a cottage industry out of releasing lovingly restored horror and cult films on DVD--there were VHS bootlegs. Before 'net file sharing (or even the Internet itself) revolutionizing the way horror fans experience the fringe under shady conditions, there were VHS bootlegs. Be it from legitimate yet rare VHS releases or expensive, damn near impossible to buy import LaserDiscs, VHS bootlegs were the bread and butter of discerning aficionados in the early to mid '90s. Mail order joints like Video Search of Miami were thee place to go for many of the movies we take for granted on DVD (and Blu-ray) nowadays. Though also nowadays, this postal circuit is dead and the glut of once blank, store-bought tapes featuring dupes from all of the world are usually worthless except for nostalgia. Though being insane, I still buy them every now and again when cheapo lots pop up on eBay. They're a bit of niche history I wasn't really part of (I "started" at the dawn of DVD), but like to visit through them. The two to the right are from a group that arrived yesterday. The others were House by the Cemetery, The Beyond, Dellamorte Dellamore (Cemetery Man), and the seller threw in the "real" Republic Pictures Director's Cut edition of Dawn of the Dead. The bootlegs are all sourced from Japanese tapes complete with Japanese titles. As any tape collector knows, Japanese pre-records tend to be pricey unless you're lucky, so this was an added benefit. Although I'd prefer the originals, $3 each is better than $40+ each. But here's where the problem comes in, while Braindead and Cemetery Man are from one place ("Dunwich Video"), the three Fulcis are from another (Luminous Film & Video Werks). Dunwich does (or did, can't find 'em online anywhere) many things right as these two dupes have clean starts of video black with complete Japanese logos and bright, vibrant SP-speed transfers. They barely look one generation removed from the source. The Luminous tapes errrrr...not so much. While also in SP, all of these share a really dark and wavy appearance, looking several generations removed from the original tape. They have shoddy starts with rolls, noise, and the recording VCR's blue idle screen. The way these were transferred makes it seem like whoever did it was pissed they had to. There's even a "LF&VW" watermark that appears every so often and The Beyond has its Japanese subtitles cut in half as an attempt to mask them. Huh?!? I'm personally not a fan of Luminous. The e-tailer was amongst the very first 'net based video importers and the first place I sampled with such purchases online years ago. Whoever runs the establishment got real terse with me in a response to one of my always kind e-mails and soon after I found the then upstart and wonderful Xploited Cinema (R.I.P.) and never looked back. The quality of these tapes only makes me dislike Luminous more, but that's beside the point. It's especially buyer beware with these types of bootlegs, much like that one famous Forrest Gump quote which I will spare you of. Haven't left a comment in a while, but that doesn't mean I'm not reading. Everytime I do, particularly with posts like this, I feel like I'm getting a master thesis lecture in awesome. I find the subject of bootlegged/duped tape trading pretty interesting, since I also started collecting seriously at the beginning of the DVD era. It makes you realize how easy we've had it, with so many obscure movies readily available on DVD and even Blu-Ray. I don't currently collect tapes, mostly because I don't have the room or funds, but I totally dig it. I do collect and trade VHS/Beta rips, which I guess is the 21st century version. But I would kill to have a real tape collection like yours. Keep it going, Jayson. Thanks Zach! I cruise over to Z for Zombies often too, love your new masthead! Yep Anthony, sometimes these bootlegs can be surprising. I have a few I bought long ago from a collector dude I knew from the swap meet, like Guinea Pig: Flowers of Flesh and Blood and ROLD, but I mostly missed out on the wave. They have additional benefits, the only other uncut 104 minute version of Braindead is a REALLY poor looking German DVD. The tape actually looks better. Oops, I meant to write: "the only other uncut 104 minute version of Braindead I own is a REALLY poor looking German DVD. I read a book once about the whole bootleg record industry. It was really interesting...but now I'm thinking there needs to be a follow up on the bootleg VHS industry. Maybe you should take a stab at it, you crazy pirate you.